The term “architecture” included in the “architectured material” approach receives a particular echo in the building sector. It inevitably evokes the technical and artistic discipline of adapting the building to its use. 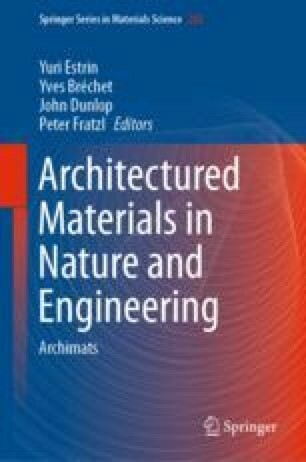 In a similar way the architecturation of materials approach in response to complex and antagonistic expectations for energy efficiency in building is promising although it is less developed in this sector than in others. However the engines for its development are indeed more present than ever: reduce the total emissions of greenhouse gases, demands for multifunctionality, and requests for inaccessible properties by a single bulk material. If mechanics has long been the central concern, the end of the 20th century marked a turning point towards energy and that is the reason why this chapter deals to this aspect and especially with the building envelope. Many properties come to complicate the game of simple thermic and mix the cards: mechanical (compression, tensile, creep), hydric (water sealing and absorption), hygric (water sorption and permeation), acoustics, aesthetics, cost, optical (visible and infrared), embodied energy and environmental impact, etc. Examples are given in this chapter. This approach started very late, only sixty-seventy years ago with the foaming of polymers and with the manufacturing of mineral wool. In parallel other material where designed at a scale closer to the product scale like hollow bricks, lightweight concretes. It is only very recently that a final improvement is done on traditional insulation materials polymeric foams and glass wool by achieving a very efficient infrared opacification. It is also in the same time that the breakthrough of the super insulation comes based on a specific architecture of the material involving more matter but dealing with the nanometer scale in order to confine the molecules of the gas in pores smaller than their mean free path. Two families of material/products are exemplified: the vacuum insulation panels and the super insulation at atmospheric pressure. For each, several optimisation problems are ongoing or on the table and the architecture of the material and product is the key for success in reaching antagonist attempts. The strongly moving context around the renewables energies is also bringing new playground for architectured materials. One first theme is the heat storage where the difficulty for reaching the wanted power could be addressed by this approach. The very wide and new second theme is the field of active walls and specific collectors where the aimed properties ask for filling some gaps in the materials spaces. Finally the approach of architectured materials is slowly irrigating the developments for energy efficiency in building with the knowledge diffusion and thanks to the education students are more and more aware of the possibilities of this approach especially to solve difficulties and then to innovate.